Still struggling every time your bootcamp instructor asks you to drop and give ’em 20? Don’t give up on pushups just yet! The total-body move can help you slim down everywhere, and with tons of variations, you’ll never plateau. Pushups are especially great for your chest, triceps, and entire core, says Curtis Williams, Under Armour Performance Coach and founder of Team Training C.A.M.P. in New York City. “Whether you’re new to exercise or a professional athlete, pushups are still beneficial,” he says. We tapped Williams and pushup guru Angela Reynolds, a personal trainer at New York Health & Racquet Club, for their top pushup rules to know. Beginning your pushup on the ground is a great way to ensure you’re doing the move correctly and building endurance through your core, says Williams. It also helps you decide if you need to modify. Lay on the ground with legs locked and abs tight, then press off. If you can’t maintain a flat back, try a modified pushup or keep practicing to increase your strength. Sure, the move may seem simple enough when you watch a coach or instructor do one, but pushups take a lot of work. Instead of risking injury, beginners should start with a modified version, on their knees or with hands on a wall, and work up to a regular pushup, says Reynolds. Use The Pushup Progression Workout to get you there! Narrow and wide pushups can hit different muscles, but they can also sacrifice form if you’re not experienced. Stick with a standard pushup stance, keeping thumbs in line with armpits and elbows at a 45-degree angle from sides, suggests Reynolds. When your back is not flat, you minimize activity in your core, Williams points out. Since the pushup is really just a moving plank, you want to engage your abs throughout the exercise. Plus, piking your hips in the air can put stress on your shoulders. Your body should look like a board (not a banana!) if you don’t want to feel lower back pain. Luckily, Reynolds has an easy fix: Engage your core by squeezing your abs and drawing your belly button in toward your spine. Keep a neutral spine, so your head is aligned with the rest of your body. To ensure your alignment is correct, Reynolds recommends finding a fixed spot on the floor and keeping eyes focused on that area until the set is complete. “I’d rather see a client do five perfectly executed pushups and build on that than 20 pushups with terrible form,” says Williams. Practicing poor movement patterns can lead to muscle imbalances and eventually injuries. You can do three sets of standard pushups for 12 to 15 reps. That’s Reynolds’ guide for progression. The great thing about pushups is that there is always a way to make them more difficult. But progressing before you’re ready will only hurt you, so master the standard pushup first. Ready to push it out? 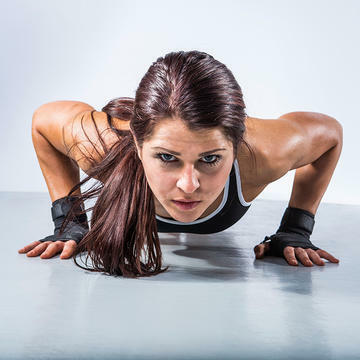 Start our 30-Day Pushup Challenge!